Alicia Air, family owned since 1980, provides expert Carrier authorized heater and furnace maintenance and tune-ups at affordable prices throughout Orange County and surrounding areas. As a Carrier Factory Authorized Dealer, we have met their rigid criteria for technician training and certification, insurance requirements, liability coverage, and excellent customer service. Our NATE and EPA certified technicians have over 32 years of experience working thousands of jobs and receive ongoing training in the latest advanced tune-up and maintenance procedures for heaters, furnaces and HVAC systems of all kinds. Our 1,000s of satisfied customers and A+ rating from the Better Business Bureau are a testament to our excellent work, fair rates, and lasting results. Regularly scheduled maintenance ensures that your heating system is always functioning properly and at the highest efficiency. 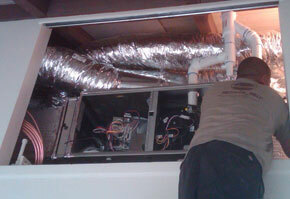 With proper maintenance, your heating unit can last decades and reduce your monthly utility costs by up to 30%. Alicia Air's Carrier authorized maintenance and tune-ups keep your unit operating at peak performance ensuring that you will recover any money invested in upkeep. It saves you money on your electric bill, extends the life of your equipment, and prevents inconvenient downtime and costly repairs or replacement. We offer one-time tune-ups on a price per visit basis with an upfront flat fee, as well as monthly, quarterly, semi-annual and annual routine maintenance programs. Our maintenance program members not only receive a great value, but also receive a discount of 5% off parts and labor and priority scheduling for HVAC emergencies during peak seasons. Our Carrier authorized tune-up and maintenance specialists perform a thorough 21-point precision checkup that will save you money on energy costs, prevent future problems, and extend the life of your heater or furnace. Our fully licensed and insured technicians will arrive at your residence promptly at the scheduled time of your appointment in company uniform with a fully equipped truck. Our honest, first-rate services are 100% satisfaction guaranteed, so call today to schedule a tune-up or to sign up for one of our routine maintenance programs. We offer convenient appointment times, and emergency service is available 24 hours a day, seven days a week. I really wanted to communicate special Kudos to your installation crew who did a superb job with the installation. They arrived daily when they said they said they would, described what their plans were for that day, prepared the area for potential messes . . .